Huawei built up a lot of good will over the past two years, only to let it slide in 2017. The original Huawei Watch was a go-to choice for those who wanted an Android Wear watch that was a bit sleeker and better built than most other choices throughout 2016. It was a bit on the expensive side, and yes it was thick, but it had a slick exterior and lugs that could adapt to just about any sort of band you wanted to put on it. When Android Wear 2.0 was readying for launch, fans awaited a refresh of the Huawei Watch for 2017 that could carry on that good will. And then, we got this: the Huawei Watch 2. A watch so clearly not designed in any way to be a successor to the original Huawei Watch, and unfortunately also not built to the same hardware standards. The Huawei Watch 2 actually had a last-minute branding change from "Huawei Watch 2 Sport," and had Huawei kept that name it would have made a bit more sense overall — but still, the more classically built Huawei Watch 2 Classic doesn't exactly follow the original Huawei Watch's design or quality, either. This is a clean break from the original Huawei Watch in terms of everything but branding. This is a big, feature-packed watch, but unfortunately one that takes a different direction in quality while retaining a high price. Does it have enough to stand out from what is already a growing crowd of 2017 Android Wear 2.0 watches? Our full review covers all the bases. I (Andrew Martonik) am writing this review after 11 days using the Huawei Watch 2, connected over Bluetooth to an LG G6. The watch arrived with pre-release software, and was not updated during the course of the review. It was provided to Android Central for review by Huawei. From a distance, the Huawei Watch 2 looks like a typical big sport-focused watch not too different from the Samsung Gear S3 Frontier. But when you pick it up, strap it on your wrist and interact with it, the watch feels much more like a toy than anything else. The so-called "mixed plastics" that make up the body range from thin textured panels around the side to faux metal buttons and a polished glass-like (but undeniably still plastic) bezel. It looks decent from a distance, but doesn't feel anything like it should. That bezel, which is gnarled like the Gear S3's, evokes the feeling that you should be able to rotate it ... but alas, it is fixed in place. Incidentally, the back of the watch that rests on your wrist is the best-feeling part as it's a solid piece of milled metal — an interesting reversal from most other smartwatches that use metal primarily and cheap-feeling plastic on the back, but disappointing nonetheless. Despite all of the apparent openings around the case, the Huawei Watch 2 is also IP68 dust and water-resistant, which is important to offer on any smartwatch today. The included sport-styled rubber band is perhaps the cheapest feeling piece of the entire watch. Even though it is plenty thick and feels relatively robust like it could survive some damage over time, it is super glossy and slick feeling — befitting of a $25 Timex from Walmart, not a $300+ smartwatch. Look no further than the quality of band you can get on the Gear S3 to see how to do this type of band right at the same price. Huawei's band certainly looks the part, but in no way executes on the quality. The Huawei Watch 2's thick bezel stands up tall over the circular display that clocks in at just 1.2-inches across, which is definitely on the small side compared to the overall size of the watch case. The 390x390 AMOLED display looks pretty good, but isn't to the level of what Samsung and LG are doing on their wearables today — thankfully it has automatic brightness without a flat tire, and is covered with Gorilla Glass. A bunch of specs with absolutely no design direction or execution. Internally the Huawei Watch 2 has the same story we're going to see time and time again in 2017 Android Wear smartwatches. A Snapdragon Wear 2100 processor, 768MB of RAM, 4GB of storage, a heart rate sensor, Bluetooth, Wi-Fi, GPS, NFC and optional LTE. Perhaps the only impressive part of this hardware is that Huawei managed to fit everything listed previously inside a case that is 49 x 45 mm, and just 12.6 mm thick, while retaining a removable 20 mm watch band — a solid improvement from the much larger and heavier LG Watch Sport. This dovetails into the only other redeeming quality of the Huawei Watch 2: it is so much lighter than the competition. It's made out of plastic, so it darn well better be lighter, but the Huawei Watch weighs just 59 grams — a full 30 grams lighter than the LG Watch Sport. So even with its 12.6 mm thickness and relatively large case size, it doesn't feel as large. And for a watch that is undeniably styled to be a go-anywhere, do-anything type of wearable, that's very important. An important quality of Android Wear from the perspective of someone who will use multiple smartwatches over the course of the year is how similar the experience is from model to model. With near-identical internals and software, the core experience of Android Wear 2.0 is consistent across watches — and indeed the Huawei Watch 2 handles notifications, navigation, Google Assistant and fitness tracking the same as the LG Watch Sport I reviewed less than a month ago. One of the best parts of Android Wear is its consistency across devices. The only places that Huawei can differentiate itself is with pre-installed watch faces and apps, which in both cases — at least on this pre-release software — it hasn't executed dutifully. Many of the pre-installed watch faces are not well-styled to match the Huawei Watch 2's hardware, and don't integrate with Android Wear 2.0's new watch face complication API. Thankfully there's a growing number of good watch faces in the Play Store, but I just wish I had the same great ones available on my LG Watch Sport (and perhaps it will in final firmware). Huawei's integrated fitness app is also a hot mess, with a subpar design and annoying reminders to do stretches throughout the day, but thankfully you can bypass it in favor of the revamped Google Fit (which can do daily step tracking and workouts) and a cadre of third-party fitness apps. Our complete Android Wear 2.0 review! Android Wear 2.0 is a complete overhaul of Google's wearable platform, from interface and design to apps and functionality. For the complete breakdown of everything that's new in the latest release, be sure to read our complete Android Wear 2.0 review. Read our complete Android Wear 2.0 review here! Skipping a rotating bezel or crown is a big miss. One of Android Wear 2.0's optional features, the aptly named "rotational input," is unfortunately not here in any form. At one time I would have balked at this as a superfluous addition, but my time with the LG Watch Sport and Samsung Gear S3 has completely converted me to wanting a rotating bezel or crown on a smartwatch. It's a clean and fast way to navigate the interface — particularly on Android Wear 2.0 — and would have been extra helpful considering the Huawei Watch 2's small 1.2-inch display and large bezel that gets in the way of precise edge touches. 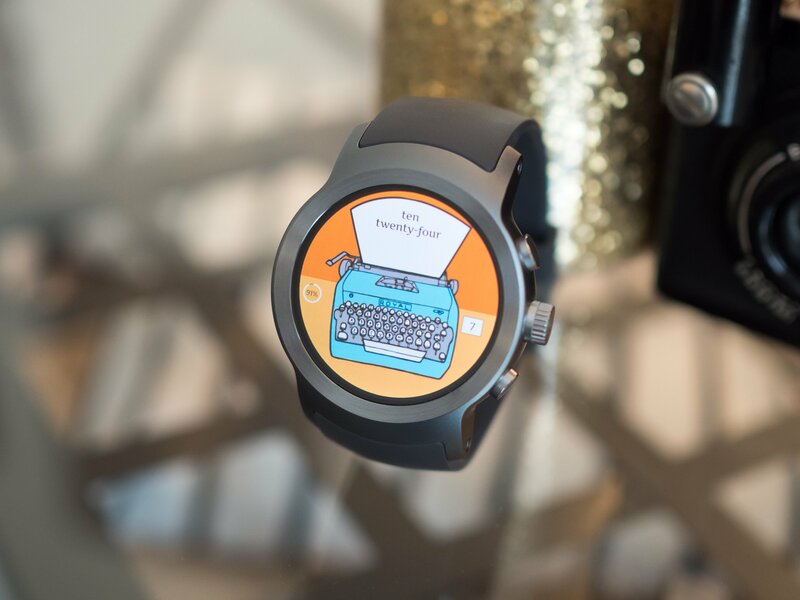 Two of Android Wear 2.0's new features — mobile payments and independent cellular connectivity — have made their way here, though, and work as they do on the LG Watch Sport. The Huawei Watch 2's SIM card tray is easily accessible without tools, and though U.S. carriers have yet to announce formal support for the watch (which hasn't yet launched stateside) there's no reason why it couldn't integrate with their number sync systems just as any other Android Wear 2.0 watch. Android Pay on a watch of this size is table stakes going forward, but again it's great to see it in a watch that's smaller than LG's and has a removable band. After using the LG Watch Sport and needing to charge it each and every night, I was surprised to see Huawei claiming two days of use out of its 420 mAh battery. Thanks to its smaller display and perhaps some software tuning, the Huawei Watch 2 absolutely can handle two days of use — at least in my usage with an always-on watch face, automatic brightness but not using LTE. A typical day of light usage would leave me with upwards of 60% battery when I went to bed. I would guess that with LTE turned on and always-on watch faces turned off, you could maybe eke out two full days depending on how much you hit the mobile data. This is definitely a two-day watch, even without special configuration. More realistically for those who are expecting to charge their smartwatch every night right where they charge their phone, the Huawei Watch 2 offers plenty of head room in terms of being able to hit the watch hard with app use, fitness tracking and even GPS for runs without worrying about it dying in a single day. Huawei's clip-on charger feels just as cheap as the watch, and while it isn't as elegant as the stand-up inductive chargers that you find on other watches it definitely gets the job done and is far preferable if you need to travel. The charger can easily be wound up and stuffed in a bag, and for a lot of people that's a bigger feature than being able to nicely display the watch on your bedside table in a cradle. It also clips on satisfyingly with magnets, so you know it will always charge when it's attached. Huawei unfortunately squandered the good will it built up over the past two years with the original Huawei Watch. The Huawei Watch 2, while retaining a sequential naming convention, is in no way a worthy step up from the original. To its credit Huawei did execute on the core feature set we expect in order to recommend an Android Wear 2.0 watch: good performance, a full spec sheet and solid battery life. This feels like a small company's first smartwatch. Unfortunately, it's the fringe decisions that don't give you the feeling that this is a complete product. The Huawei Watch 2's design seems fine from a sport watch perspective, but the build quality and materials are far from great. The display is a bit on the small side and is just middle-of-the-road in terms of quality. The Huawei-added watch faces and software aren't compelling, and the lack of a rotating bezel or crown feels like a missed opportunity. For less money, it may be easier to accept the Huawei Watch 2 for what it is. But at €329 for Bluetooth and Wi-Fi or €379 with LTE, Huawei is asking way too much money for this low level of design and hardware execution. As a complete product, the Huawei Watch 2 feels befitting of a small company making its first smartwatch, not a massive global consumer electronics maker aiming to improve on what was one of the best smartwatches of the last generation. If you're feeling nostalgic about the original Huawei Watch, or just enjoy all of the specs and features that Huawei is able to push into the Huawei Watch 2, but (understandably) don't like its exterior, there's a good chance that the metal-and-leather Huawei Watch 2 Classic will be a better one to consider. Its more understated case, metal construction and more typical lugs will fit with more styles of clothing — but at €399 is even more expensive than the Huawei Watch 2.